Beautiful sterling silver (925) peridot earrings in Shamrock style. All our jewelry is made with care and detail. The designs and gemstones are unique and chosen with care. No pair of stud earrings is the same. Read more about or find out which zodiac signs belongs to peridot. The sterling silver stud earrings are about 1 cm and the round peridots are about 4 mm each. Don’t soak your gemstone jewelry in water but wipe them clean with a soft cloth without chemicals. Sterling silver ring with a facetted square cut peridot gemstone. Ring size 16. 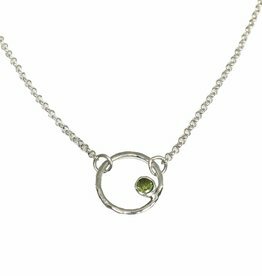 Short sterling silver necklace with a Circle of Life and a faceted sparkling peridot. Length necklace 39,5 cm, with an extension chain of 5 cm.